Nectin family members (nectin-1, -2 , -3 and -4) comprise an extracellular domain with three Ig-like loops, a transmembrane domain and a cytoplasmic tail capable of binding the actin-binding protein afadin via a four amino acid conserved motif (Glu/Ala-X-Tyr-Val). Nectin-like family members (Necl-1, -2, -3, -4 and -5) share a similar structure, but are unable to bind afadin [Takai Y, et al, 2003]. These findings from cell culture work are further supported through studies in model organisms, such as the fruit fly (Drosophila melanogaster)  and nematode (Caenorhabditis elegans)  (as reviewed in ). In Drosophila embryos the highly regulated process of dorsal closure of the epidermis involves the projection of filopodia and lamellipodia from cells at the leading edge of the epithelial sheets, in much the same way as previously described in cell culture studies . In C.elegans embryos, sealing of the epidermal sheets around the entirety of the embryo in a process termed ventral enclosure, also utilizes filopodia. Moreover, α-catenin was shown to rapidly accumulate at filopodial contact points in a cadherin-dependent manner and in doing so promote junction formation. In cells at the leading edge made mutant by removing cadherin expression, filopodial protrusions were still extended, however catenin accumulation and subsequent junction formation failed. 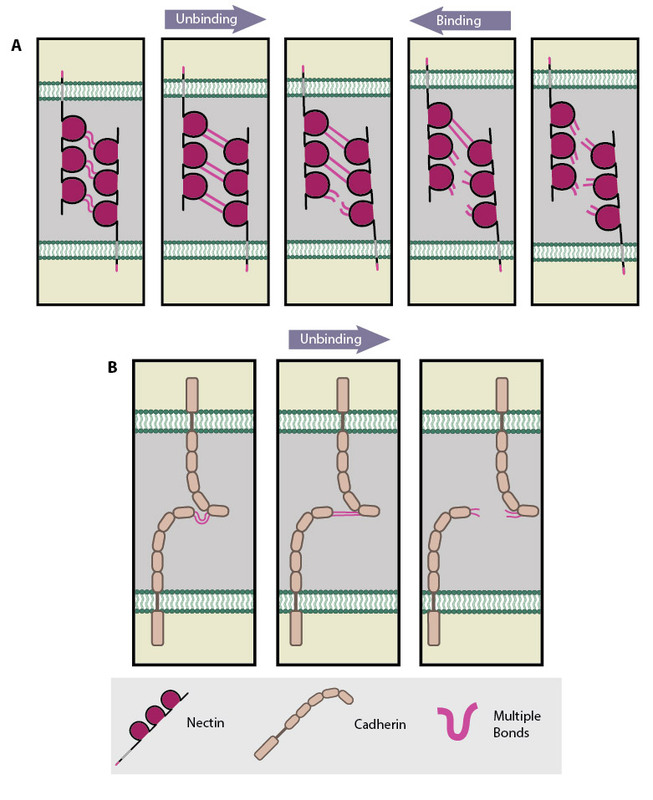 The term ‘filopodial priming’ was coined to describe the formation of nascent junctions via the recruitment of α-catenin to filopodial tips engaged in cell-cell contact via their cell surface cadherins. This process leads to further recruitment of cadherin-catenin complexes in order to strengthen the nascent junction . Another family of proteins that have been detected at nascent junctions are the nectins and nectin-like (Necl) proteins (see Figure below). These proteins have been suggested to initiate AJ formation prior to the involvement of cadherins in some circumstances, as evidenced predominantly from mammalian cell culture studies (as reviewed in ). Nectins comprise a single extracellular domain of three Ig-like loops, a transmembrane domain and a cytoplasmic domain capable of binding the actin-binding protein afadin (as reviewed in ). Nectins, like cadherins, can interact with each other in trans between apposing cells and in cis on the same cell. Nectins utilize their first and outermost Ig-like loop to engage in trans interactions and their second Ig-like loop to engage in cis interactions, which is a pre-requisite to the subsequent formation of trans interactions . In contrast to cadherins, these interactions do not require calcium. The formation of nectin-nectin interactions at sites of cell-cell contact have been shown to promote further nectin-nectin interactions and increase the clustering of nectin-afadin interactions , with afadin suggested to provide a direct link to the cytoskeleton. The resulting nectin-based adhesion sites are thought to serve as focal points for the subsequent recruitment of cadherins and eventual formation of adherens junctions. This forms the basis of the ‘fork initiation and zipper’ model for cell-cell adhesive junction formation, as proposed by Irie et al  and supported through mechanical force measurements . Adapted from [Tsukasaki Y, 2007]. 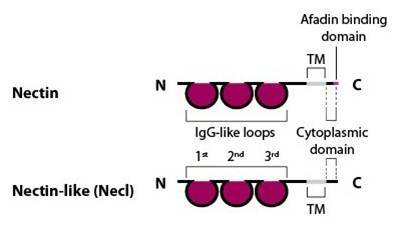 For clarity, single nectin molecules are shown on each cell surface, however it is established that cis interactions of two or more nectin molecules is required before intercellular trans interactions can occur. (A) Multiple bonds nectin-nectin domains are uncooperative in nature resulting in ‘zipper-like’ binding and unbinding. (B) Multiple bonds between cadherin-cadherin domains are cooperative in nature and longer-lived compared to those bonds between nectin domains on apposing cells. Consequently these interactions unbind in a parallel manner. At the single molecule level, Tsukasaki et al demonstrated that trans interactions between nectin domains were uncooperative, i.e. they showed ‘zipper-like’ unbinding. 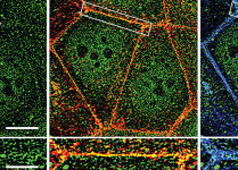 In contrast trans interactions between cadherin domains were cooperative, i.e. they showed ‘parallel-like’ unbinding (see Figure below). These dynamic properties of nectin and cadherin binding were suggested to fit to a ‘fork initiation and zipper’ model of junction formation . In this model, initial cell-cell contacts are mediated by the shorter-lived, uncooperative nectin-nectin domain interactions, which being more rapid in binding and unbinding are considered better suited to exploratory cell behavior. Initial nectin-nectin trans interactions stimulate downstream signaling resulting in increased cell-cell contact sites, for example through promoting increased filopodial protrusions. This process is described as ‘fork initiation’. Following the ‘fork initiation’, ‘zippering’ occurs to stabilize junction formation. Longer-lived, cooperative cadherin-cadherin domain interactions are suggested to mediate this phase, due to their more robust nature when compared to uncooperative, nectin-nectin domain interactions. It should however be noted that genetic studies in model organisms have brought into question the relative importance of nectins compared to cadherins in the formation of AJs (as reviewed in cite]20571587[/cite]). Studies in knockout mice lacking different nectins showed that the loss of nectin was not embryonic lethal, as one would expect if nectins were crucial to the formation of all AJs . Knockout mice lacking the nectin-binding protein afadin did show AJ defects during an early stage of embryonic development called gastrulation . 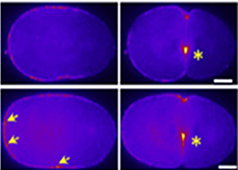 However, these defects were less severe and occurred later than those observed with mice lacking the cadherin-catenin complex. Similar results were obtained in fruit fly embryos with cells mutant for Echinoid (equivalent to nectin) or Canoe (equivalent to afadin), AJs were still able to form . The involvement of nectins in AJ formation may be therefore be cell type and context specific, with the cadherin-catenin system being a more globally implemented system.